So we see that on December 8, 2008, at 6:31:50 am est (ignore the edt you see on the chart–yet another bad on my part–6Sag52 is rising which makes Jupiter the chart-ruler. Mars, which is now (5.02.2008) leaving opposition with Jupiter across the 22/23 Can/Cap axis (and still within the ‘objectifying people’ range which is 19–23 Can/Cap and indicates a tendency to forget or neglect the fact that people are living, breathing, human beings. Will having its Jupiter Return just after the Nov elections make a difference for the R-Party presidentially? It will be interesting to see if the final outcome is known by Dec 8 or if rep elections are affected by the generosity of Jupiter. Saturn 21Vir16 is direct and at Mc, the Aspirations/Goals Point of the chart and thus of the Jupiter Return (or Reward Cycle, if you prefer) itself. Saturn is restriction, control, authority, delays, etc….but Saturnian form is necessary to manifest anything real or ‘concrete’ as we say–and concrete is ruled by Saturn for its hardness and form. Concrete can even be used to mimic rocks and stones which are ruled by…Saturn. Saturn/Neptune (‘secret government’) = Mc: capitulating to the demands of the environment totally; moodiness; loss of ambition; materialism vs idealism; sudden loss of courage; emotional suffering; illness. Mars/Saturn = Mc: overcoming obstacles stoicly; silent pride. 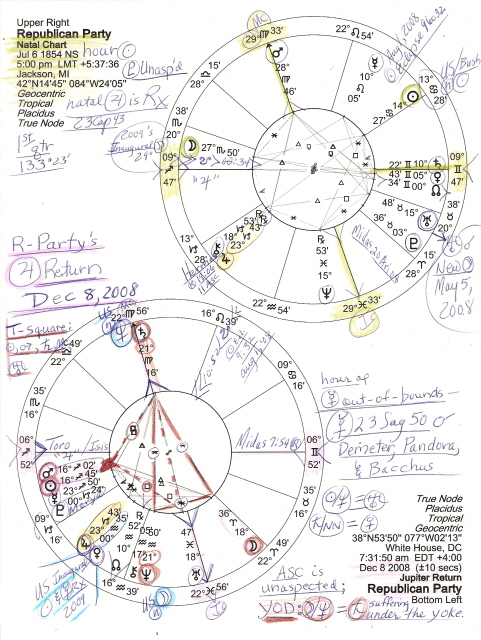 Upper right you see the Republic Party’s natal chart which also has expansive Sagittarius (‘the seeker’) rising; Sag is ruled by Jupiter, the significator in a national chart of the Republic Party (GOP.) Hatched on July 6, 1854, this chart shows the R-Party’s Unaspected Pluto 3Tau36 (the Discovery Degree of Chiron 1977–see Pages List in sidebar for Chiron’s Discovery Chart–“A Rainbow’s Pot of Gold”) so the riches being guarded by the dragon, Pluto, works on its own, thanks–and isn’t sharing. R-Party’s natal Moon 27Sco50 in 12th house, is quite near the degree of the Inaugural Moon on Jan 20, 2009, noon. Perhaps I shall add more about that later if possible. And what about Jupiter’s position in the natal chart? You mean GOPers listen at all? I did not know that. I thought their internal drummers were way too loud for such pointlessness. Talking points must be followed–and hammered into the collective eardrum in their attempt to forge the ‘reality’ they desire with their persnickedy “critical when opposed” Mars in Virgo. Thing is, the Democrats’ natal Mars is also in Virgo! And so is the natal Mars of Bush43. Argghh, a pattern? It’s pookies everywhere I look. As you know, America’s natal chart (July 4, 1776) also contains an out-of-bounds (of the earthly plane) Pluto, the power-behind-the-throne, 27Cap+. Transit Jupiter, 23Cap43 on Dec 8, 2008, will be triggering US natal Pluto before December ’08 ends. The plutocracy duo, Pluto/Chiron which has been transiting around the 22 – 24 Cap area for some months, will be activated by the GOP Jupiter around the party’s Jupiiter Return. Pluto/Chiron represents power-that-wounds, oppression, primal violence, racism, feminism, corporatism, even fascism, and their Great Conjunction of Dec 30, 1999 strikes me as a time when New Millennial plans were being finalized for the one-world-government agenda. Their conj has ushered in much of what the world has suffered in this decade and ties in with Nostradamus’ Mother of All Eclipses (aka the ‘King of Alarm – or Terror – Eclipse’) of Aug 11, 1999. Although it may have nuclear influence (expansion of plutonic power), the Jupiter Return – or Reward Cycle as Noel Tyl terms it – is the ‘resources increase’ transit, so I hope it perks up the US and the world economy. And the GOP? I’m not nearly as concerned about their overflowing coffers. It’s the self-serving finger on The Button that gripes my craw.